It's definitely not 8 by 11 but the colors are beautiful and vibrant and the rug is soft. We have a carpet pad under and it is wonderful. 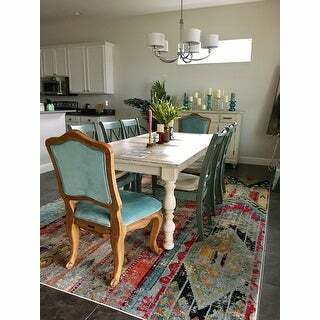 This rug was my first rug purchase with Overstock.com. I absolutely love it and I am glad that I also purchased the suggested pad to go with it. 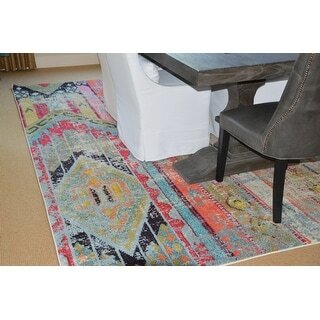 The Safavieh Monaco Vintage Bohemian Rug is under my dining room table and its soft and warm on the feet. I am very pleased with the quality of this rug for the price. 5 Stars from me! I LOVE this rug. Goes with everything and I don’t have to worry about adding pieces to the living room and having the color clash. The color variety is so nice and keeps the room looking fresh and interesting. I can definitely see us having this rug for years and years to come. Easy to clean and isn’t molting like crazy either. 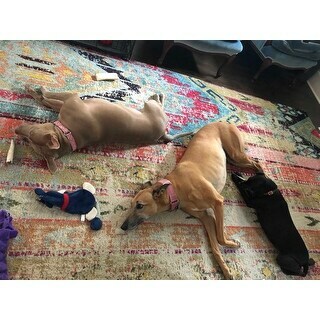 (Cute puppies not included nor recommended with the purchase of this rug nor any other). 😊 the colors are nice and bold but somehow muted at the same time. The whites aren’t really all that white-more of a cream-type color so it doesn’t show wear and tear and dirt very readily (important in a home with three dogs and that is very lived in). The only issue we’ve had is with all the color variety it’s really hard to see the dog bones on the rug so we’ve ended up missing a few and stepping on them-ouch! If you have a kid with legos or a dog with bones you’ll have to keep an eye out for those items so you don’t injure yourself! The rug is pretty plush but we also have a pretty thick rug pad we use with it as well. I have thought about buying companion rugs with this design for our keeping room and entry area. 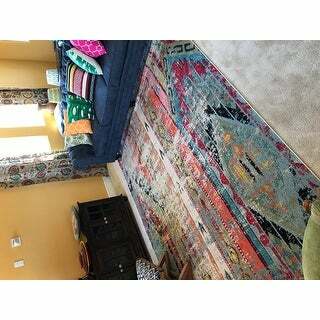 Or similar rugs to this style. Very versatile and can’t recommend it more! Shipping was quick and easy. Overstock always makes sure to take care of us! LOVE this rug! Not only does it add the needed pop of color and design to my beige dining room, but it is so soft and has a great thick pile. The hair and occasional upchuck from my two cats comes off with no problem. 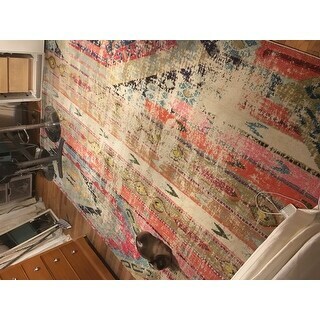 I bought this Safavieh Monaco Vintage Bohemian rug for my daughter and she absolutely loves it. It pulls all her furniture and decorations together perfectly. The colors are so vivid and it actually looks vintage. Where to begin.... first off when I originally ordered this rug it arrived at my home in a timely manner even though there had Been very bad weather conditions it didn't seem to slow it up lol.. fed ex delivered even brought it in the house for me.. neighbor was chasing fed ex so she talked with him and i started talking with her.. fed ex leaves neighbor leaves I go inn to open my rug I realize the end is open and rug dirty from rubbing on back of fed ex truck .oh how my heart sank..i had stressed and stressed Over which area rug to order and decided to go back to the first one I loved which was this one..i didn't open the rug at all because i knew it was dirty all on the end .Called customer service who immediately took all the info and placed a new order to replace the rug.. when it came extra care was taken so the end wouldn't be tore off again..omg I was right I LOVE THIS RUG!! Layed out almost instantly .. my only problem is what accent colors to use because there are so many colors to choose from.the thickness was way more than I expected and love the distressed look. the kids love laying on it because it feels amazing.. seems to hide dog hair really well I have a lab and I dont have to vacuum no where near as much as I used to with the old rug.. you can't go wrong with this rug .I got the largest one and we love it.. You WILL NOT regret this purchase..and customer service was so helpful. Product info was spot on. I've had the rug down 2 months it layed flat almost immediate. I would recommend this product. 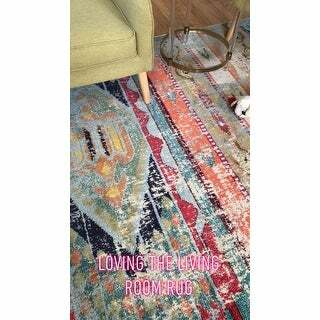 I love my Safavieh Monaco Vintage Boho rugs and the warmth, color and personality they have brought to this old house. The colors allow for unlimited decorating ideas. Well made, so soft. Compliments and wows are reactions of guest. Recommend! 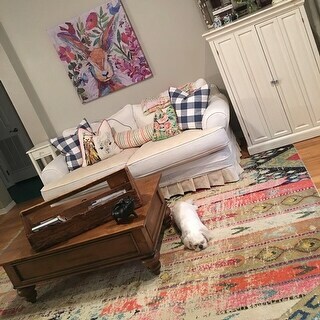 This rug is very true to size and color. The hues are slightly more vibrant in person but it is a great rug that incorporates many colors for decorating Options. 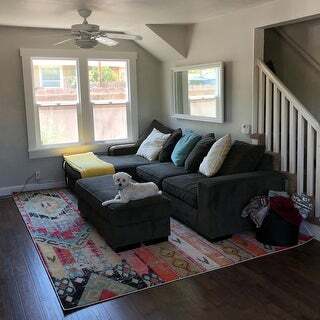 I have had many compliments on the rug and am very happy with the purchase. The colors in this rug are perfect. Vivid, yet distressed looking. I'd buy this rug again and again. No toxic smell out of the wrapper! Looks great, colors are a little brighter than sales photos but I love it. Hides dog hair and dirt too. Took me forever to decide on a rug for my living room and I'm so glad I picked this one! It's absolutely beautiful and looks stunning with my black floors. 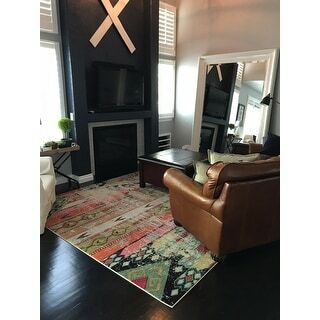 I received the rug even sooner than Overstock had estimated (4 days). Rug rolled out flat - didn't need to flatten out any lines/wrinkles and is so soft to the touch. Everyone is correct - this rug is brighter than it appears online - but there is still a lot of light coloring and distressing. It doesn't read as a dark rug. Also, the size is great. 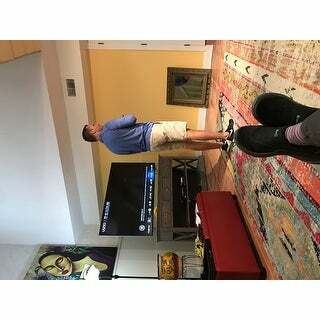 The extra foot (11 feet instead of the typical 10) makes it fill the room well. Plus, it is SO soft. I'm really happy with this rug. Everyone who sees this rug wants one! It's beautiful and comfy cozy!!! This has turned out to be my favorite rug of all of the ones in my home. Multi colored that are pleasing to the eye and you can literally match your own colors to it. Enjoy! Rug is even more beautiful in person! Perfect statement piece! You NEED this rug!!!!! It's Boho Perfection! Honestly, the 5 star ratings on this rug are totally deserved! If you're not looking for color, then scroll on. It's soft, plush, and great quality. The binding around the edge is a soft cream color, and the distressed background really gives it an old world boho feel. You will not be sorry for purchasing it, and Overstock had the best price (when on sale). 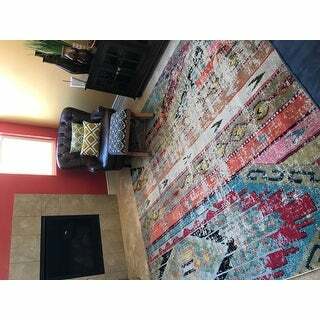 Great rug with beautiful, vibrant colors. 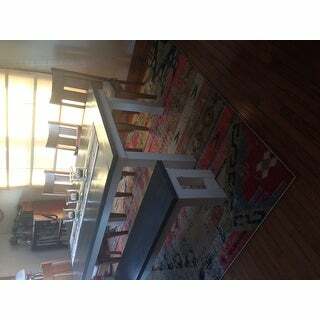 The quality is great and it looks nice with many styles of furniture. I would purchase this rug again and again. I already have a smaller rug just like this one, therefore I knew that I liked it even before I ordered it. I love the mixture of vibrant yet muted colors which go beautifully with my furnishings. This one is going in my dining room to give it that special “pop” that this boring room needs. Since it is connected with my living room it will compliment that room now as well. 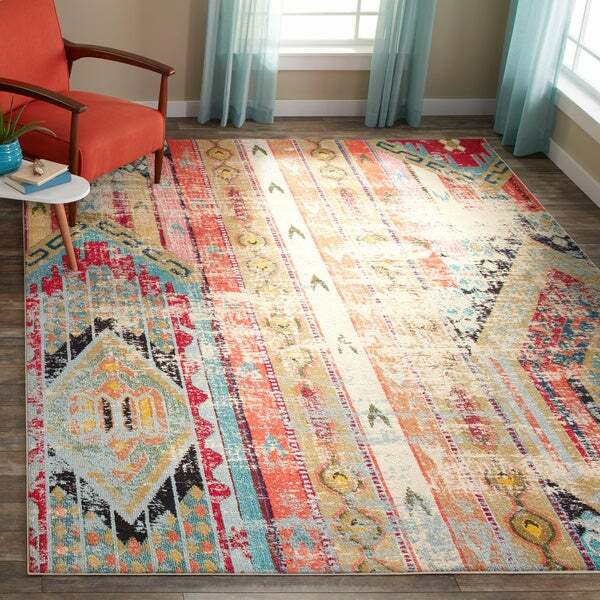 This rug is beautifully boho chic style. I can’t say how many comments I receive on this rug. The colors are as is in the photo and the quality is excellent. 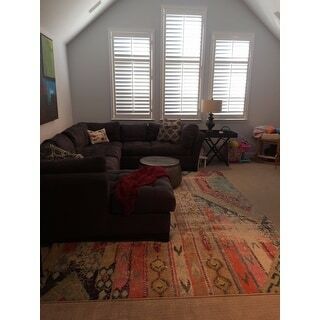 Love the rug, great price. Minus one star only because I wish it were plushier. This rug is beautiful! We have received so many compliments on it. It is very colorful but not too loud or busy. Very stylish. Looks great with my mid century modern furniture. Beautiful, no surprises on colors, excellent control quality, well packed, delivered on time. "Is the rug exactly 8' x 11'? The area it is going in is only 7'11" x 11"
This rug is intended to be a true 8' x 11' rug. Please note sizes can vary up to a couple of inches. "I really want this but have carpet anyone have this over carpet?" I have this rug with 1/4' rug pad and it does fine, so it should do well with carpet. i have this rug on carpet and i love it so much! 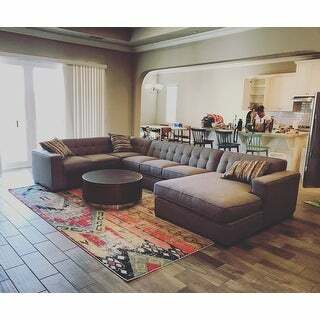 "Hi is there any way to find out where to buy the sofa which is pictured with the rug? i have searched high and low on your website and can not find it. thanks manu"
Unfortunately no. The sofa is not available. "Is this rug for outdoor use on a porch?" "I have tan furniture in the room I am putting this in, so I am good there. I want to pick up some pillows at a pier one sale this weekend and was wondering if teal/coral/coastal colors will work?" You really could go with any colors. This rug is so versatile. Consider yellow, blue, and yes coral and teal. "I can't believe no one has comment on what it's made of. I am allergic to wool. So? Thx. Tracy"
Materials are:	Polypropylene, Synthetic. I hope it helps. "Is this rug loop pile or cut pile?" This rug has a cut pile. It is Turkish cut pile. I have animals and this rug is perfection. Looks expensive. Beautiful.